Thank you to Bloomsbury Children's Books for sending me this book via Netgalley in exchange for an honest review. Bobby Seed is used to going the extra mile for the ones he loves, and he does it willingly. It’s up to Bobby to get Mum her pills, to help her up the stairs, to laugh her out of her pain. It’s up to Bobby to comfort his little brother Danny, to explain why Mum’s not like the Mum they remember. One day, he’s asked to go further. Mum asks him the big question. The one many would find unthinkable. If he agrees, he won’t just be soothing her pain. He’ll be helping to end it. Before I start this review I just want to give out a quick trigger warning. This book does deal with themes of illness and assisted suicide so if you are easily triggered by these maybe this book isn't for you. Bobby Seed is used to helping the ones he loves, willingly. It's Bobby who gets his mum her pills, helps her up the stairs and tries to laugh away her pain. It's up to Bobby to look after his little brother, Danny and to explain why their mum isn't like the mum they remember. One day he's asked to go further when his mum asks him the big question. If he agrees he won't just be soothing her pain. He'll be helping to end it. I'll start of by saying that this was such a elegantly written book that had me reaching for the tissues a few times. It also took me on a journey of knowledge. Having not had any experience of family or friends suffering with MS The Weight of a Thousand Feathers encouraged me to go and do some outside research into the disease. This in turn helped me understand the story a lot better. I also enjoyed going into the mind of a young carer. Having heard a lot about young carers but having never read a piece of fiction featuring one it was another learning point for me. A lot of research must have been done prior to writing this novel so I applaud the author for that. It must have taken a lot of work. Family is a very big piece of this story and I loved how beautifully the bonds of this family were touched upon. The way Bobby cares so much for his mum and brother, Danny was gorgeously heart-warming to read and these scenes made me tear up the most. The whole family unit just felt so raw and real and I think that's why it got to me so much. 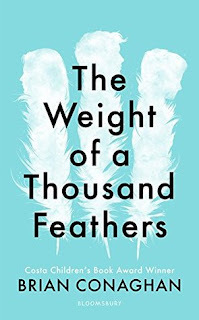 The Weight of a Thousand Feathers focuses on one particular topic which has divided opinions amongst many and I am glad it is being spoken about in YA. This topic made me think about what I would do if I was put into Bobby's situation and I had many unstoppable thoughts going through my mind. If a member of my family was suffering to the point that it was unbearable to watch would I relive them of that pain? But would I want to say goodbye sooner than I thought? It really did get me thinking and I do admire when a book can do that to me. With Bobby, I could understand his angst and his frustration at his mothers illness and not knowing what to do regarding the situation she put him in. Like I mentioned I wouldn't know what to do if I was put in his shoes. His caring nature also drew me to him as a character and I loved the brotherly bond between him and Danny, was so sweet. If I was going to say anything negative about this book it would be that I just couldn't bring myself to like the characters of Bel or Lou. I tried so very hard but I just found them to be unlikeable. Bel, was way too out there with her feelings for Bobby and with Lou, I felt like he was using Bobby in a way. 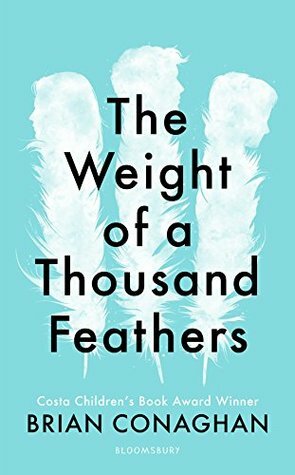 The Weight of a Thousand Feathers overall was an emotional, beautifully written read that could make even the toughest of people tear up. The way that the subject matter was dealt with was exquisite and this is a book that will be sticking with me, I can assure you of that.